The Peterson St. Patrick's Day Series for 2018 is crafted from select briars finished in a glimmering emerald shade in 12 perfectly weighted, smooth shapes. A vivid yellow stem seamlessly emerges from a polished Silver Army Mount with inspiring continuity. Each pipe reflects brilliance, balance and a distinctive Irish tradition! "Peterson of Dublin 2018 St. Patrick's Day" and the bowl shape number are stamped on the bottom of the matte finish green bowl. Celebrate your Irish heritage in style! These highly collectible pipes are a stunning addition to any pipe enthusiast who enjoys annual collections. These always go fast, so get yours while you can. Special limited edition pipe comes gift boxed in a Peterson dust bag. Made in Ireland. 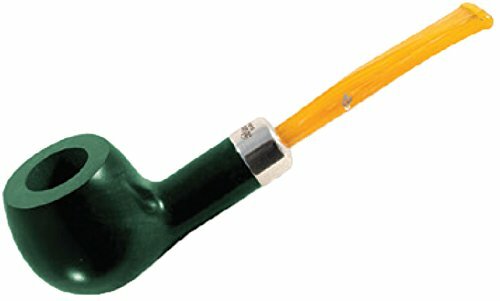 Entire collection of Peterson 2018 St. Patrick's Day Pipes are shown but this listing is for shape 408 only. Shape 408 Pipe Length: 5.87" Pipe Weight: 1.80 oz Bowl Height: 1.66" Chamber Depth: 1.31" Chamber Diameter: 0.82" Outside Diameter: 1.73"
The Peterson St. Patrick's Day Series for 2018 is crafted from select briars finished in a glimmering emerald shade in 12 perfectly weighted, smooth shapes. Each pipe reflects brilliance, balance and a distinctive Irish tradition! "Peterson of Dublin 2018 St. Patrick's Day" and the bowl shape number are stamped on the bottom of the matte finish green bowl. Special limited edition pipe comes gift boxed in a Peterson dust bag. Made in Ireland. Shape 408 Pipe Length: 5.87" Pipe Weight: 1.80 oz Bowl Height: 1.66"
Chamber Depth: 1.31" Chamber Diameter: 0.82" Outside Diameter: 1.73"
If you have any questions about this product by Peterson, contact us by completing and submitting the form below. If you are looking for a specif part number, please include it with your message. KHALIL MAMOON WORLD CUP 34” COMPLETE HOOKAH SET WITH BUILT IN ICE CHAMBER: Single Hose shisha pipe. Handmade Egyptian Narguile Pipes. These are Traditional Middle Grade Metal Hookahs. KHALIL MAMOON 1001 NIGHTS 36" COMPLETE HOOKAH SET WITH BUILT IN ICE CHAMBER: Single Hose shisha pipe. Handmade Egyptian Narguile Pipes. These are Traditional Middle Grade Metal Hookahs.